The night was hazy. Too hazy. That aside, I have a little bit of news! I’m officially a part of the Pitch Wars blog team. Will you see a ton of posts by me? No, I’m primarily working behind the scenes to make sure everything looks right before the posts go live. I’m working with this fabulous group: Brenda Drake, Lisa Leoni, and Jaime Dill. This is in addition to the work I’m doing with All The Kissing. Hey, the busier we are, the more productive we get, right? As far as writing goes, I’ve sent off edits and am taking a tiny breather to read a bit before delving into finishing not one but two books. Where is my clone? Of course I can only physically work on one at a time, but I love them both and have been like a ping pong ball, going back and forth. Spoiler: one of them is not a romance! But it is a novel I love and am passionately eager to finish. So we’ll see what happens, and which one gets done first. If you haven’t yet joined us on Twitter for #FridayKiss, please do! These Twitter hashtag games displaying lines from a work in progress serve more purposes than just showing off in front of thousands of your best friends. When I work with the weekly theme, I’ve found it helps me notice trends and over-use in my own writing, first and foremost. If I use the theme word the same way more than twice, I’ll go back and do some editing. Then, when I read the feed, I can see what the most common uses are for the theme word. It’s both fascinating and insightful. Maybe I’m looking at it from the perspective of someone who did technical editing for a lot of years, but I know it’s made me keenly aware of the way I use words and terms in my fiction. Of course, your mileage may vary, and no analysis is required. The second benefit is really the one I was flippant about above. If you’re writing and want to be published, you need to get used to sharing your words. Is it scary? Absolutely. Does it get easier with time? Absolutely. But look at this as a proving ground for yourself. If you don’t put yourself out there now, will you be able to do it later? Will you gather the courage to submit to contests? Will you be brave enough to query agents, editors, or publishers if you’re too shy about your writing? So come along and practice with us. You can find the prompt posted every Thursday evening at 7pm Pacific time at @yourfridaykiss. And to make it a little bit more entertaining, there are quotes. About each prompt. Each week. And no spoiler here: I have a lot of fun finding those. 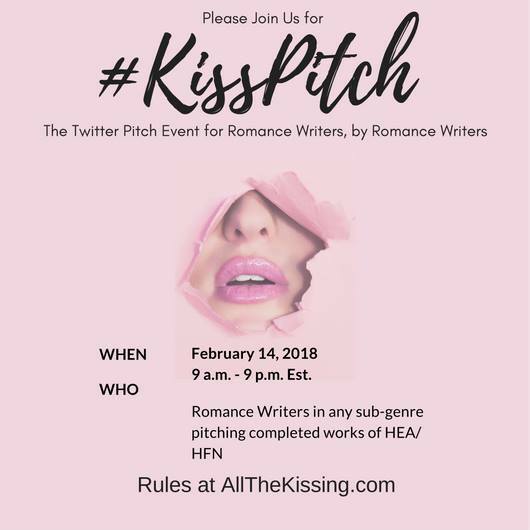 Categories: Personal, Writing | Tags: #fridaykiss, all the kissing, Pitch Wars, Seattle, smoke, twitter, writing, writing is scary sometimes | Permalink. Will any of you be in Denver in July for the RWA National Conference? If so, please find me and say hello! I’ll be the one with the short hair [subtext: look for my badge] staying at the hotel. Seriously, though, I would love to meet up with people. Those of us from All The Kissing are having an event (that makes it sound so formal! It’s a drop-in-and-say-hello thing) on Friday, July 20 at 8pm at 16Mix inside the downtown Denver Sheraton. There…um…might be some swag to give away too, if that’s a motivating factor for you. Here, have some details. If you can’t be there, stop by and say hello at the Golden Heart® Ceremony luncheon on Thursday afternoon! The vegan option last year was very tasty, but I might be too filled with nerves to eat my lunch this time. One thing is certain: I will be so delighted to put names with faces, faces with names, faces with voices and Twitter handles, share a few laughs, and enjoy every last moment. 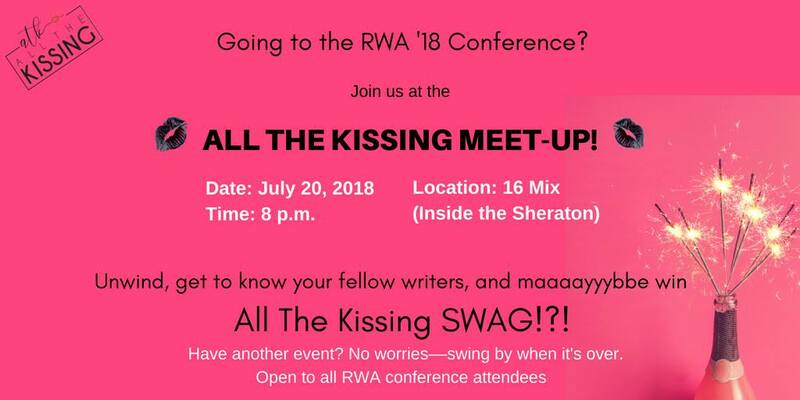 Categories: Personal, Writing | Tags: #fridaykiss, all the kissing, Denver, meetup, romance, romance writers, RWA18, RWA2018, writing | Permalink. Every time I hear that question, I mentally add the words my Juanita and think of Lowell George and Little Feat and their song Fat Man in the Bathtub. It’s off the excellent live album Waiting for Columbus, in case you’re looking for something to listen to. I haven’t heard it for a while, but I can fix that. Hold please…there. Now I’m listening to it. I do best with music most of the time, but curiously not really when I’m writing a first draft. There, I don’t want anyone else’s words filtering into my subconscious. I haven’t been writing a first draft. After a fairly epic NaNoWriMo where I churned out some 90,000 words of first draft, I took December off. I don’t like to edit too quickly after drafting–the work needs to sit for a while. In fact, I wrote a blog post over at All the Kissing about keeping on with your NaNo novel, and another one about being kind to yourself during the editing process. Every now and again, it’s good to take a break. Honestly, I’d reread my NaNo draft so many times that I couldn’t see the words on the page any more. I knew the MMC (that’s “male main character” for those of you who don’t write romance) needed a better arc and I decided to reorder a lot of what happened in the book, although overall I was pretty pleased with my first/zero/garbage draft. But I also knew I needed some breathing space. Instead of working on that book, I went back and re-read my Pitch Wars manuscript and decided that needs work too, although nothing as extensive as a complete rewrite. Having worked on two more books in the series, there are little characterization tidbits I need to go in and firm up. Otherwise, it’s still pretty good. I will say that going back and rereading something I wrote over a year ago leads me to appreciate how much I’ve grown as a writer since then. I suppose no work of fiction is ever really done. There are always things about it that can be finessed and improved. I also suppose that part of learning to be a writer is knowing when to let go and say enough. Time to let it go, send it off, send it to bed, shelve it–whatever the right thing is to do in the moment. I reached that point with Book 2 in the series at the beginning of November. I’m pleased with it. It’s ready. I’m not saying there isn’t room for improvement, because go up a paragraph. There’s always room for improvement. But at some point we have to let our babies leave the nest, right? During December, though, I did a few things that weren’t writing. I visited family. I got back into my favorite art and crafts. I read, re-read, but didn’t touch my NaNo novel. I read a few books. I woke up to snow on Christmas morning, just in time to get to the Seattle airport (that was a fun trip; there wasn’t enough de-icing equipment at SeaTac but I made it to Arizona and my mom eventually). Mostly, I lived like a normal person, whatever that is. A normal person who didn’t churn out a 90k book in 30 days. Now I’m reading a manuscript for a critique partner. I’ll be reading a book sent to me for a review next, and finally getting back to my own series (oh, I decided on a SERIES TITLE for it too, which was fun, because it’s a theme common to all the books in it). I told people I wanted to wait to revise Book 3 until the ideas were so overflowing I could no longer contain them. I’m getting to that point. Dreaming about the characters, thinking about their story arcs, creating ways to improve them and make them more multidimensional than they already are. So that’s what I’ve been up to, my Juanita, my sweet chiquita. Here, have some Little Feat. Categories: Personal, Writing | Tags: all the kissing, editing, NaNoWriMo, process, writing | Permalink. Hi there, fellow writers. Are you writing romance? Getting ready to query, or not sure about the query you’re sending out? Would you like a little feedback? 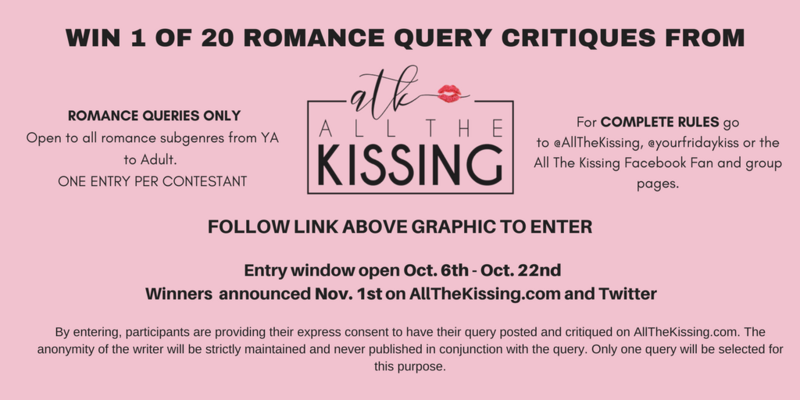 If the answer to any of them is yes, here’s a query critique giveaway for you. It’s open until October 22. If you have any questions, ask away. Categories: Writing | Tags: all the kissing, feedback, query contests, query letters, querying, romance, writing, writing contests | Permalink.